1. 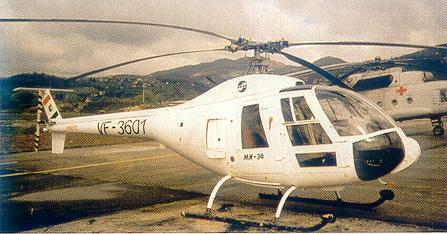 The Russian company Maquette have announced the future release of a 1:72 Mil Mi-34C 'Hermit', #Mc-3115. 2. I've had a quick look at the new 1:72 Italeri HH-60H #1210 which is of course based on the earlier SH-60B kit #011, now discontinued. The fuselage halves have been re-modelled, with the extra window in the position formerly occupied by the sonobuoy dispenser, and the ALQ-142 ESM antenna removed, though the fine raised panel lines are still there. The instrument consoles are now incorrect. On sprue B the torpedoes are still there but not used. There are many changes & new parts; the belly radome, sonobuoys, operator's console, pylons, etc. have been replaced by HIRSS exhaust shields, fuel tank & pylon, ALE-39 countermeasures dispenser covers, dozens of antennae, rear-view mirrors, ALQ-144 'disco-light', machine gun, etc. 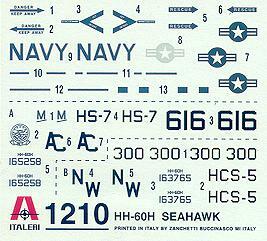 The decals provided are for HS-7 165258/'616'/AC and HCS-5 163765/'300'/NW. "Certainly not in the same league at the Professional Models 1:48 C.30, but still a neat little kit. There's one sprue of 42 crisp, clean short run injection moulded parts (excellent surface detail on the fuselage) plus two vac formed wind screens, a resin engine and exhaust collector ring... and a set of decals with markings for three aircraft...French, Spanish and RAF (there are also Czech markings but these are not shown on the instruction sheet!). Cockpit detail is rather basic...floor, seats, head rests and instrument panels (some sidewall detail is moulded into the fuselage halves), but the landing gear is well detailed (but with all the struts involved, this could prove to be rather complicated) and the engine and rotor look good." 4. Cam Decals have issued a sheet of national insignia in various sizes for the Royal Saudi Air Force, Iraq, Bahrain, and Oman, entitled #4A014 Air Forces of the Persian Gulf Pt 1. I don't know if #XS087 is intended for the Italeri MH-53E Super Stallion or for their MH-53J Pave Low III. The cockpit mouldings are not quite the same. HELO6 2 three-quarter pilots "to fit Airfix-style Cobra gunship"
What this last item means is anyone's guess. I suppose 'three-quarters' means that the unfortunate guys have no legs, but the 'Airfix-style' is a bit confusing. 7. Hawkeye Models Australia have issued a decal sheet for the US Army UH-60A Blackhawk shown on pages 72 & 74 of the Squadron / Signal Blackhawk Walkaround #19. This aircraft was painted in overall Sand FS33303 with Olive Drab doors and other areas showing OD where the Sand paint had worn off. It carries tally marks behind the pilot's door representing 72 Iraqi POW carried to internment camps during the Gulf War, plus the word 'TINNIN', whose meaning is unknown to me. Scale is presumed to be 1:72, and they are available from the Aviation Workshop.